by Brianna Crandall — June 15, 2018 — Teknion Corporation, an international designer, manufacturer and marketer of innovative workplace interiors, captured three awards in the prestigious Best of NeoCon Competition this week at the Neocon 2018 contract furnishings show in Chicago. Teknion’s ergonomic winner in the Technology-Integrated Solutions category are highlighted below, and a future FMLink article will highlight the Office Accessories category award and additional products the company introduced at NeoCon. At NeoCon 2018, Teknion previewed the Innovation winner Cerebro — a new workplace technology concept that passively connects and maintains comfortable lighting levels and monitor eye heights when using three common workplace products — a height-adjustable table, task light and display monitor arm. Cerebro integrates the abilities of these products to provide visual comfort and create a new ergonomic experience. The movement towards providing sit/stand options in today’s workplace has raised questions regarding time spent standing. When transitioning from seated to standing work height, the distance between monitor eye height and typing height grows, while the amount of light at the worksurface intensifies as you get closer to overhead light sources. User adjustment of the monitor height and the light level on the surface is critical to maintaining user comfort. Cerebro addresses both of these concerns. Adjustable work tools such as sit/stand stations optimize the user experience while working. The seated work posture is the primary focus of most adjustments made. However, when using height-adjustable tables, task lighting and monitor arms, they require secondary adjustment when moving from the seated to standing work posture. Cerebro passively connects and adjusts these ergonomic work tools. Cerebro has multiple settings to accommodate as many user sizes and preferences as possible. With Sanna Lightbar IC (Integrated Cerebro), the user establishes their preference for the amount of light they want on their worksurface and sets this value using Lumistat. Lumistat acts as a thermostat for percentage of light output of the lightbar. Sanna Lightbar senses the amount of ambient light and provides the required amount of light output to match the amount selected using Lumistat. As the workstation gets closer to, or further away from, overhead lighting via sit/stand working, the Lumistat value will be maintained as the Lightbar automatically adjusts light output to provide a consistent visual user experience. The Swerv Monitor Arm IC (Integrated Cerebro) is designed to be used with a Teknion electric height-adjustable table, built-in or wall unit that uses a Linak electric linear actuator system inside. 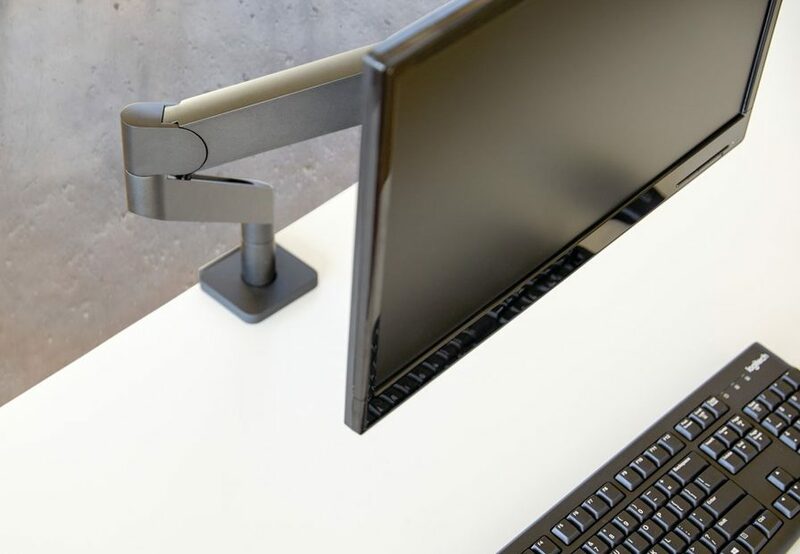 Using a Teknion-specific custom digital switch, the user sets their “delta” — the difference in eye-to-typing height between seated and standing — then the monitor arm will automatically adjust this delta when transitioning between seated and standing work. Swerv is a fully adjustable, spring-assisted dynamic arm designed to support today’s evolving technology demands and changing workstyles. Swerv features a new patent-pending, weight-balancing mechanism similar to Teknion’s patented height-adjustable table weight-balancing mechanism. This innovation enables 98 percent of monitor weights on the market (5 to 12 lbs. or 2.27 to 5.4 kg) to be balanced and adjusted with little effort. With monitors getting larger and lighter, Swerv can be reconfigured to support all monitor sizes — typically all screen sizes under 32 inches (81 cm) — within the weight limit. Swerv supports the changing needs of users and the technology they require to work. 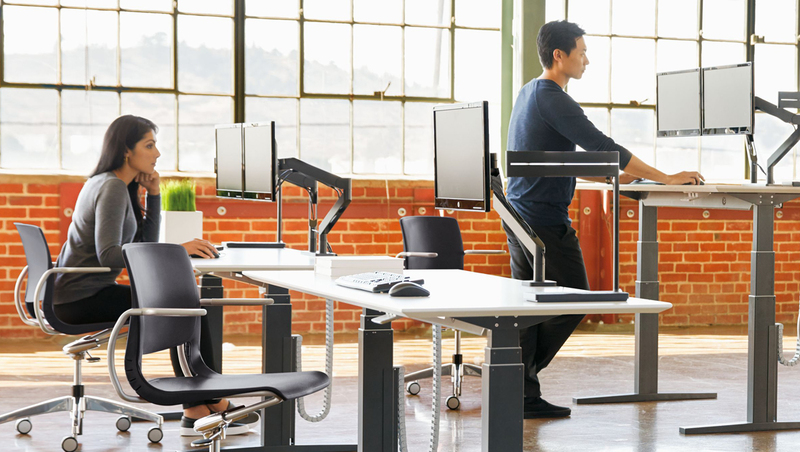 It responds to the growing demand for flexibility and movement throughout the day, allowing users to periodically change positions while working and adjust their workstations to maximize comfort. Monitors are becoming larger and more difficult for users to adjust into positions that support neutral body postures when working. Swerv was designed to swiftly move from a dual to a single configuration, or be positioned in multiple mounting locations while maintaining pleasant aesthetics for the user, all without the use of any additional tools or components. The monitor arm comes standard with the three-in-one Swerv Smart Clamp that can be configured into an Edge Clamp, Round Grommet or Thru Mount. The Dual Arm application can be separated into two Single Arm applications, allowing Swerv to accommodate all screen geometries and user-desired setups. Thoughtful wire management is integrated into the hollow lower reach arm, allowing Swerv to be quickly adjusted to new positions without interference. Cables are managed from the screen to under the worksurface, letting users concentrate on the task at hand and not cable clutter. For more information about the new products as well as new introductions and awards from Studio TK and Luum, visit Teknion’s NeoCon Happenings page. For more FM-specific information on Teknion’s product offerings, see the company’s FMLink ad. Building products, furniture, lighting and more — find out who won the Good Design Awards for 2018 January 18, 2019 In "Products and Services » Other"
Wanna take a load off your facilities manager? Formalize how, when, and where your people work July 15, 2018 In "Workplace Strategies » Workplace Evolutionaries"
Desk lamp with occupancy sensor, (very) smart whiteboard, wireless lighting management app, more highlight the iF Design Awards for 2019 April 8, 2019 In "Products and Services » Other"